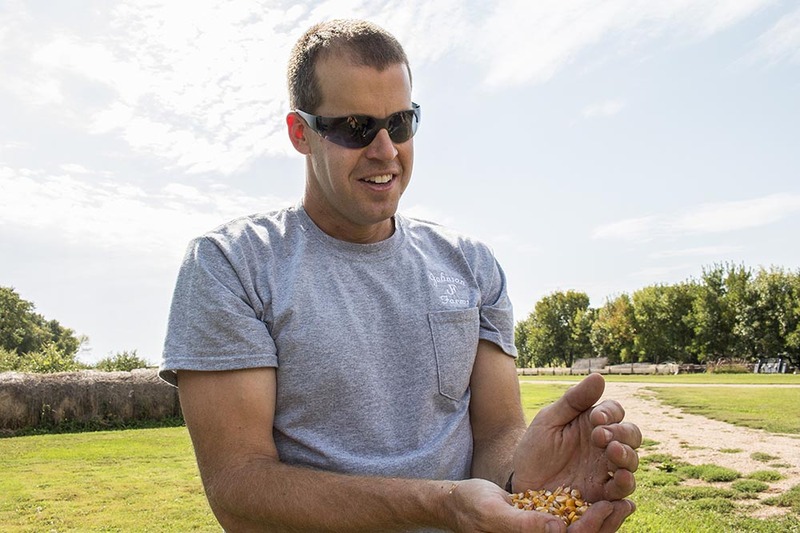 Aaron Johnson holds a handful of corn at his farm in Madison, South Dakota, Johnson Organic Farm. Aaron Johnson is an organic producer south of Madison, South Dakota in Orland Township. 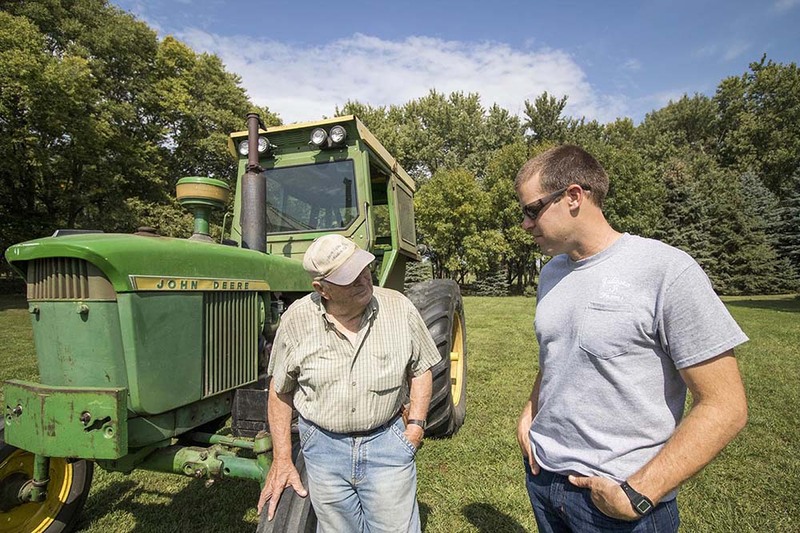 He’s been farming since 2009 and is a third generation farmer. He farms on land that has been in the family since 1939. He sits outside his home on a hot September day with his wife Kirstin. His 89 year old father drives up and down a soybean field on a green John Deere tractor just across the street. “I produce corn and soybeans, oats and alfalfa and stock cattle. Those are basically my five enterprises. Out of 560 acres, there’s about 400 acres of tillable land and 83 acres of pasture. I’m able to farm and raise cattle with my cousins," said Aaron. Aaron, his wife Kirstin and their youngest child at their home in Madison, South Dakota. Aaron gets choked up when he talks about the story behind the Johnson Family Farm and their transition to organic farming. "We were the laughing stock of the county, this was before I was even born so I can’t imagine what they went through. Having to put up with being an outcast like that...and then now where we are today. I feel very fortunate." Aaron and his father, William, stand in front of their tractor. Today the biggest challenge that the Johnsons face is maintaining their organic status. Inadvertent spraying of conventional crops can threaten the status of the organic crops should the Johnson fields be contaminated. “Whether they spray their own crops or they have an applicator do it for them -- it’s not intentional by any means,” said Aaron on spraying in the area. Luckily, the Johnsons are mostly surrounded by extended family who are also organic producers. Aaron and his family have found great success in using a distributor, NF Organics, to market and spread their product. “They are great, they take a small commission but they line up all the buyers and they line up the trucking. If there was a buyer that couldn’t pay us for some reason or another, NF Organics has lawyers on retainer. They also have money set aside to pay the farmer. So there’s a lot of comfort knowing that when a load of grain leaves I’m going to get paid,” said Aaron. Aaron holds a handful of soy beans. 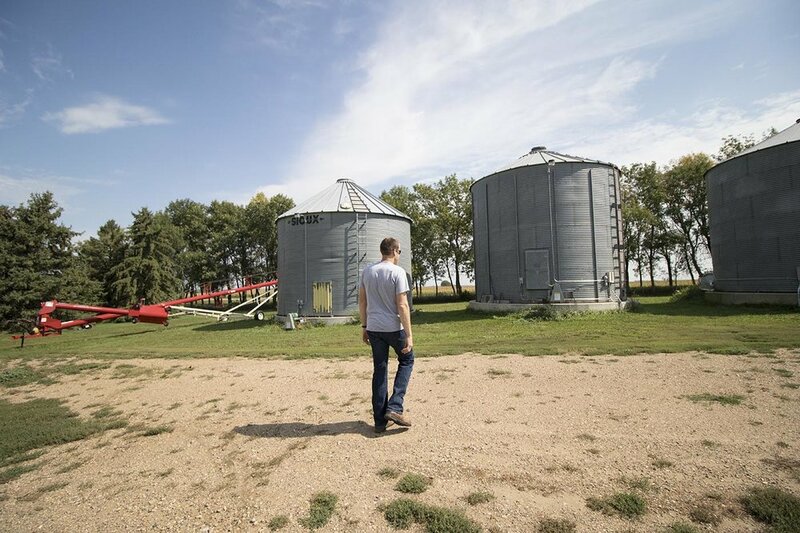 In the course new farmers learn business strategies, financial planning and information that’s needed to start farming and making a life out of it.